This is the most impressive archaeological site on the island of Rhodes, where the dramatic natural landscape is enhanced by the picturesque quality of the more modern town. The most important archaeological monuments are to be found at the Acropolis, but there are also interesting ruins scattered at various points within the town and just outside it. A cobbled road leads up to the Acropolis, and for those who wish to avoid the tiring climb there are donkeys for hire at the main entrance to the town. The first ruins you will encounter are the mediaeval walls, built by the Crusaders (early 14th century) on the remains of earlier defenses, both Byzantine and ancient. Along the mediaeval walls are a very small number of towers, which follow the natural contours of the high ground. On the area of level ground where the mediaeval steps begin you will see to your left an ancient triimolia (a kind of ship) carved in the rock circa 180-170 B.C. On the ship’s prow there once stood a statue of the general Agisandros Mikkion (it has not survived) which, according to the inscription, was the work of Pythokritos, creator of the Nike of Samothrace. The great mediaeval steps lead up to the Governors Palace of the Crusader castle, which consisted of three buildings, of which two have survived. It was first restored in the early 20th century by the Danish Archaeological Mission and then, during the period between the world wars, by the Italian authorities. As you come out of the Governor’s Palace you will see a series of vaulted constructions supporting the “andiro”, a man-made terrace which opens out in front of the Hellenistic stoa. A number of the columns are still standing. It was built in the shape of the Greek letter fl, in the late 3rd century BC, with protruding wings to the side, each with a frontage of four columns. It was 88 m. long, 9 m. wide and had 42 columns. The terrace was laid out later and two underground cisterns were also constructed to collect rainwater from the roof of the stoa and from the steps of the Propylaea. The scattered plinths with their inscriptions remind us of the time when the whole area was full of statues dedicated to the goddess. Next to the Governor’s Palace stands the church of Agios loannis, built on the inscribed cruciform plan. It is not clear precisely when it was built; some assign it to the late 11th – early 12th century, others to the 13th – 14th century. It was constructed on the remains of an earlier church, judging from the architectural fragments found on the Acropolis and dating from the 6th century AD. A monumental flight of steps, behind the eight central columns of the Hellenistic stoa, leads up to the Propylaea of the temple of Undia Athena, another stoa structure in the same shape. Only the foundations have survived. At the two ends of the Propylaea there were areas where the votive offerings made to the goddess were stored. The stoa was built of porous stone at the end of the 4th century B.C. 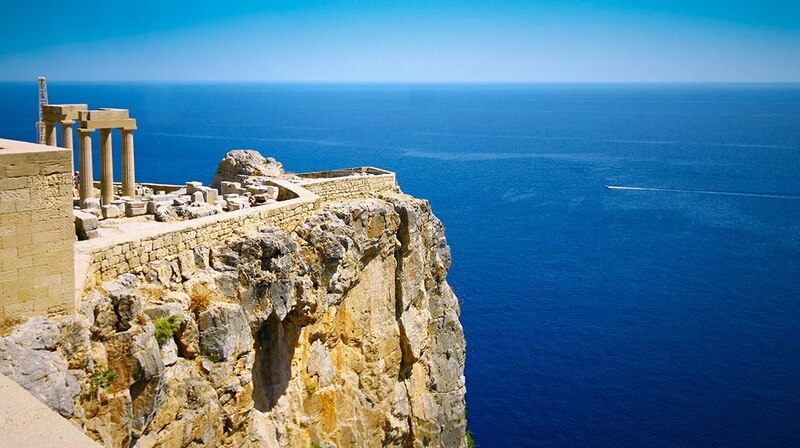 At the highest point of the Acropolis, on the edge of the cliff, stands the temple of Lindia Athena. This is an unexpectedly small Doric temple, with a stoa of four columns at each end. There still remain in the interior the votive altar and the plinth of the worshipped statue of the goddess. This building too was of porous stone, with mortar facing, and dates from the end of the 4th century B.C. (Open daily, 8.30am-2.40pm in the winter, 8am-7pm in the summer).